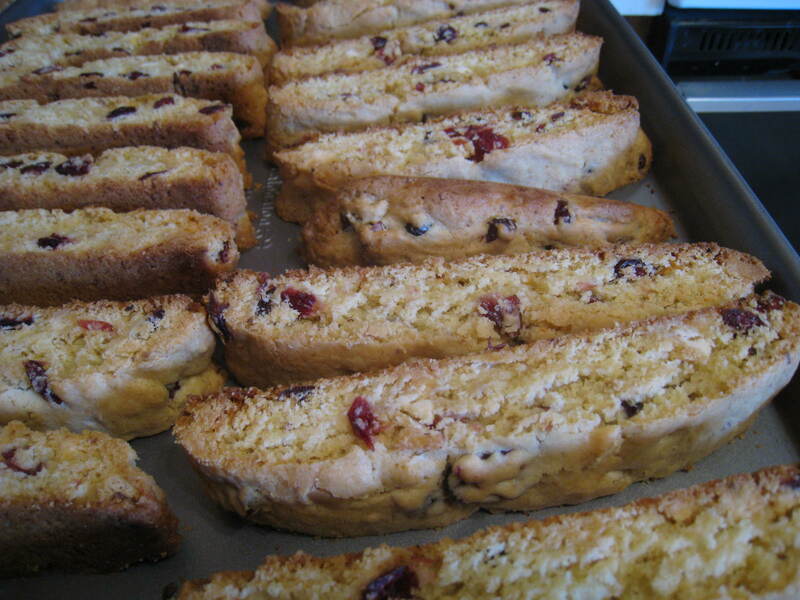 I’ve been wanting to try making biscotti for awhile now and finally did. I had leftover ingredients from all the cranberry hootiecake cookies I made earlier this month and found this recipe to use up some of them. I gave them as gifts to my daughter’s daycare teachers. Hopefully they liked them as much as my husband! Preheat the oven to 350° F. Line a baking sheet with parchment paper. Combine the flour, baking powder, and salt in a medium mixing bowl; stir together with a fork and set aside. In the bowl of an electric mixer fitted with the paddle attachment, beat together the sugar, melted butter, eggs, vanilla extract and lemon zest until well combined. With the mixer on low speed, add in the dry ingredients and mix until just incorporated. Stir in the white chocolate chips and dried cranberries with a rubber spatula. Divide the dough in half. Working with one portion of dough, shape into a 12″ x 3″ log on the prepared baking sheet. Repeat with the remaining dough so that the logs are laying parallel and spaced apart on the baking sheet. Bake until the logs are golden brown, 30 minutes. Remove from the oven and let cool for 25 minutes, maintaining the oven temperature in the meantime. Carefully transfer the logs to a work surface and remove the parchment paper from the pan. Using a serrated knife, cut the logs into ½-inch slices on the diagonal. Lie the slices on one of their cut sides back on the baking sheet. Return to the oven and bake for 12 minutes more. Transfer to a wire rack to cool completely. Store in an airtight container.